San Diego – Recognizing the importance of preventative measures this flu season, Councilman Mark Kersey has partnered with WAXIE Sanitary Supply and GOJO, the makers of Purell, to equip all San Diego City libraries and recreation centers with a hand sanitizer station. Last season, 342 people died from complications from the flu, 255 more than the previous season and the highest total since the County of San Diego began tracking flu deaths nearly 20 years ago. According to the San Diego Health and Human Services Agency, people should get vaccinated by the end of October and supplement vaccination with hand washing and hand sanitizer. At WAXIE, we believe that giving to others in our community creates a lasting impact. That’s why in August 2018 WAXIE Denver partnered with Kärcher to lend an extra hand to the cleaning & maintenance staff at Mount Saint Vincent. MSV is a pre-K through 8th grade school that also provides advanced mental health & trauma care services in the Denver region. Before the start of school year our combined team pitched in to deep clean and spruce up a few restrooms, classrooms, hallways, windows and multi-use areas so that students & staff would be starting out the school year fresh. On Tuesday November 21st, 2017, General Manager Bob Gattis and Account Consultant Stacy Main of the WAXIE Ontario branch along with Eloise Reyes, Assembly Member from the 47th District, joined together to provide 10 veteran families a Thanksgiving meal, in support of Heroes Warehouse in Fontana, CA. Mary Mohr, the founder of Heroes Warehouse dedicates all her time working to give our veterans the items they need to live a comfortable life with the basic necessities we take for granted, like a bed, toiletries, food, blankets and so much more. On Wednesday March 29th, myself and a motivated group of 14 individuals from the WAXIE Sanitary Supply sales team descended on Perkins K-8 in the Barrio Logan section of San Diego to lend a hand to the custodians with their restorative cleaning. 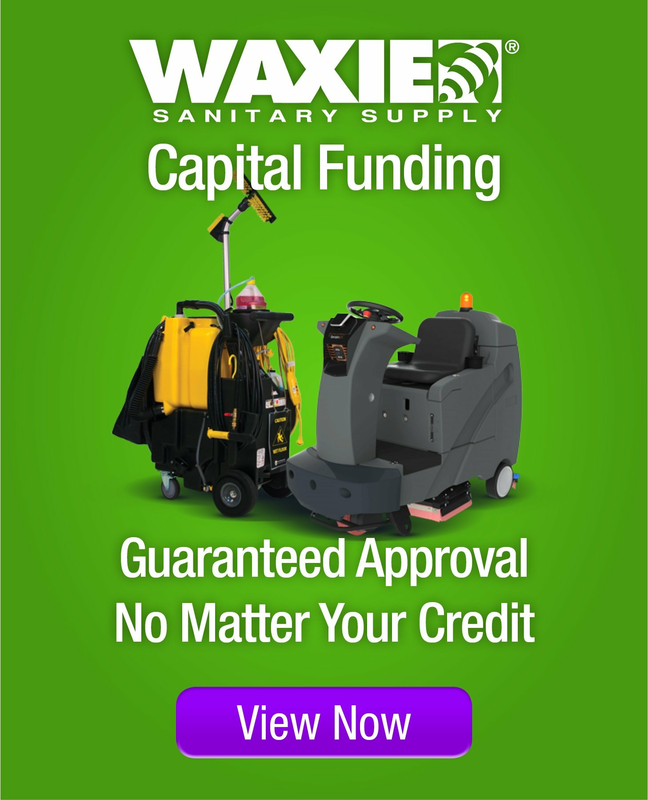 As the morning began, the WAXIE San Diego team unloaded two trucks worth of commercial floor care equipment and restorative bathroom cleaners, and immediately got to work. Thanks to a prior survey of the school, it was determined that the areas of primary concern for the staff were the floors in a large multipurpose room, their kitchen, a teacher’s lounge, and multiple large restrooms. What a GREAT organization…“Heroes Warehouse”! Mary Mohr who started this charity a few years ago has a huge heart. This organization assists American veterans who were previously homeless or in need by providing items such as furnishings, sanitary products and supplies to help them fill their homes. WAXIE Ontario has supported this organization for the past 2 years and will continue to support our local veterans. Providing people with the tools and education they need to do a job successfully can be a challenge, but when it happens the rewards are immeasurable. In 2013, with the encouragement of Charles Wax, I was recruited to be one of the instructors for the City College of San Francisco’s Custodial & Porter Training Course program, which trains and educates students for entry level employment as a custodian. Over 200 students take this course every semester. WAXIE Santa Ana Gives Back to Local Nonprofit! On May 26th, 2016, members of Team WAXIE Santa Ana went to help Working Wardrobes prepare to move into their new facility out in Irvine, none of which would have been possible without the special contributions from John Levulis, John Berry, and Oscar Alvarez. The leadership in attendance included Alice Sawaya, Michael Gould, John Torgerson, and Erik Chantarapan. Stacy, along with several other WAXIE employees including WAXIE Ontario's General Manager Bob Gattis, attended one of the American Cancer Society's Making Strides Against Breast Cancer "Kick-Off" events on Thursday, August 13th as part of the Riverside Chapter. WAXIE is a proud sponsor of this organization. WAXIE Sanitary Supply in San Diego is a proud supporter of Computers 2 San Diego Kids and the “Chamber Computer Challenge.” The challenge is a campaign benefiting Computers 2 San Diego Kids, who are celebrating their 10th year of refurbishing computers donated by local companies to give to families who do not have a computer in their household. We'd like to help by getting the word out. The San Diego Regional Chamber, Computers to San Diego Kids (C2SDK) and U-T San Diego released this press release the other day. In an effort to provide low-income families and children with a computer that will bring technology to their home for the first time, the San Diego Regional Chamber of Commerce has joined forces with U-T San Diego and Computers 2 SD Kids (C2SDK) to launch the “Chamber Computer Challenge” campaign.